Iraq – Did the U.S. stop too soon in 1991? 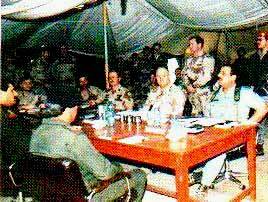 The decision by the political leadership of the coalition arrayed against Iraq to halt offensive operations March 1, 1991 has been controversial since it was made. In the wake of the September 11 terrorist attacks and the ongoing American war on terrorism, there has been suspicion of Iraq’s involvement in the aircraft hijackings and/or the anthrax attacks. Many pundits and commentators have blamed the previous Bush administration for allowing Iraqi leader Saddam Husayn to remain in power after his military defeat. There were valid reasons to stop offensive operations against Iraqi forces. Even in hindsight, the decision was probably correct in light of the geopolitical situation at the time. As American-led coalition forces were dealing a severe defeat to the Iraqi armed forces, political analysts at both the Central Intelligence Agency and at the Pentagon’s Defense Intelligence Agency were concerned that as the coalition ground offensive pushed further into Iraq and threatened the strategic city of Al-Basrah, Iraq might collapse into three distinct enclaves—the Kurds in the north, the Sunni Muslims in the central region around Baghdad, and the Shi’a Muslims in the south. It had always been American policy that the territorial integrity of Iraq be maintained, primarily to counterbalance Iranian power in the region. The collapse of Iraq into three enclaves might be too tempting for the Iranians to ignore – after all they were still smarting from a military defeat at the hands of the Iraqis just three years earlier. At the same time, there had already been a subtle shift in the attitudes about the war on the part of Arab and Muslim coalition military officers as well as the local Saudi population. In great measure this change had been brought about by the media’s depiction of the gruesome nature of war as it was crystallized on the so-called “highway of death.” This now-famous stretch of highway led from the western edge of Kuwait City north through the Al-Jahra’ pass and onto the four-lane desert highway to Iraq, the only major road out of the city to the north. To defend the highway leading north to the Iraqi border, Iraqi combat engineers had sown extensive minefields on both sides of the road. Any attackers would be channeled to and through the narrow pass. These defenses were to create the conditions that led to the scene of destruction on the evening of February 25, 1991. A U.S. Air Force F-15E fighter-bomber disabled an Iraqi vehicle in the pass, causing a major traffic backup that stretched for several miles. With the pass ahead blocked and a continuous stream of American fighter aircraft bombing and strafing the convoy, many of the soldiers attempted to drive their vehicles into the desert, and in so doing, drove into the minefields laid by their own engineers. Those who did not get out of their vehicles on foot died on the road. Strictly speaking, the air attacks destroyed a convoy of tanks, armored personnel carriers and military vehicles—all valid military targets. To many of our coalition allies, however, particularly the Arabs and Muslims, it was the United States, the superpower, killing defeated Arabs who were attempting to retreat from Kuwait. The subtle distinction between military operations and the needless taking of Arab lives grew as pictures of the carnage on the road were shown repeatedly on news broadcasts around the world, including the Arab countries. In some of these countries, the popular impression of Desert Storm had changed from the liberation of Kuwait to the wanton killing of Arabs. Granted, one of the objectives of Desert Storm—one not often publicly acknowledged—was the destruction of Iraq’s military machine. However, many of the Arab and Muslim coalition allies felt we were now crossing the line. To them, Kuwait had been liberated. It was time to stop the killing. Pundits and commentators have blamed then-President George Bush for calling on the Iraqi people to overthrow Saddam Husayn and then not supporting the revolution. In reality, the president had encouraged the Iraqi armed forces to overthrow the leader. There were indications that this might in fact happen. As the United States and its coalition partners began the withdrawal from the battlefields of southern Iraq, Iranian Islamic Revolutionary Guard Corps (IRGC) officers infiltrated into southern Iraq and set into motion the sequence of events that the United States had feared. The Shi’a in the south, spurred on by their IRGC advisors, began the uprising against the Iraqi government. The Iraqi army began operations to suppress this uprising, sometimes brutally. In the north, the Kurds decided to take advantage of the situation and began their own uprising against Baghdad. Again, the Iraqi army moved against the rebels. The paradox: The Iraqi armed forces that were prepared and probably would have overthrown Saddam Husayn were too busy maintaining the territorial integrity of Iraq. Thus, the people that were trying to overthrow Saddam Husayn were ultimately responsible for keeping him in power. As a result, we are still faced with Saddam Husayn in power in Baghdad. There never was any intention of removing him in 1991, and the internal events that might have led to his overthrow at the hands of his own people were disrupted by Iranian actions. Although leaving him in power in 1991 might appear to be a mistake now, in the context of events as they existed made perfect sense then.